Every gamer knows about Nintendo's Mario and Sega's Sonic the Hedgehog. Most gamers also know that Mario and Sonic have been long-time rivals in their video games. This rivalry can now be brought to life in the Olympic games. Mario and Sonic is made to be a multiplayer game, so it's obviously best with friends. In multiplayer, up to three friends can join you. Some events require you to take turns, while most have all players play at once.The camera works different depending on the event. In events like fencing, there is one camera angle, regardless of how many players, while other events use a split-screen. Each event is explained before you begin, although if you already know the instructions, you can choose not to read them. The following is a brief look at some of the events in the game. 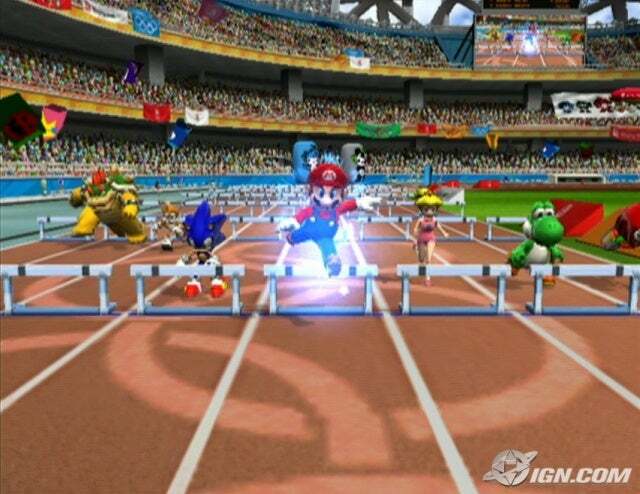 100M Dash - The standard race where you shake the Wii remote and nunchuck to represent your legs. The faster you shake, the faster your character goes. Archery - Players try to hit the center of the target. You aim with the Wii remote and nunchuck to represent the bow and arrow. Hold down the A and B buttons when you're ready. Release the buttons to fire the arrow. Swimming - You race other characters to the end and back by moving the Wii remote and nunchuck the way your character wants you to. Trampoline - Fling the Wii remote up to jump and press the specific buttons to do tricks. The higher you jump, the more points you earn. Javelin Throw - In this event, you start by running like a race. After you run a few seconds, the screen will tell you that you can stop running. When you're near the foul line, fling the Wii remote like you're throwing the pole. Dream Events - Tricked-out versions of real Olympic events that use power-ups from the Mario and Sonic series. Some of these include Dashing, Fencing, and Platforming. Every Dream Event needs to be unlocked. In single-player mode, you can do Olympic tournaments to earn trophies. Tournaments are designed specifically for single player, so you can play this when you want to play by yourself. You can also beat missions designed for specific characters. Sadly, some missions have strange goals, like finishing in second place. Every time you finish all the missions for a specific character, you earn an emblem that you can use to represent your load game file. Another great addition is that you can play with your custom Miis. As cartoonish as they are, they actually fit with the game quite well. Unfortunately, as party games go,there are a few games that have poor controls. However, I found more games enjoyable than not. The only games that have bad motion control are fencing and table tennis. Another unique addition to this game is the trivia. By playing some mini games, you unlock Olympic facts that go through the history of the Olympics. Graphic wise, all the worlds and characters look good, if not great. The Olympic areas look colorful and realistic. The game has an issue though: no matter what sport you're doing, the characters won't change their appearance. The only difference is that in swimming events, Sonic will use a life jacket, because he can't swim. Besides that, Mario and Sonic is a pretty good looking game. The sound in the game is really good. Most of the tunes are new, but there are some from past Mario and Sonic games. As for voices, all the characters past voices reprise their roles as far as I can tell. Mario is voiced by Charles Martinet, Sonic is voiced by Jason Griffith. The only concern in the entire game is the mild sports violence in events like Fencing (-1 pt.). Other than that, the game is as clean as a whistle. 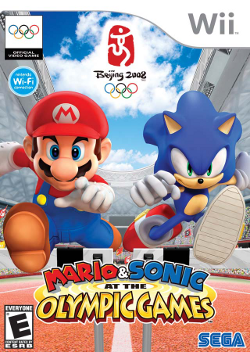 Mario and Sonic at the Olympic Games is my favorite sports game tied with its sequel, Mario and Sonic at the Olympic Winter Games. The motion controls are really good, the graphics and the music are great, and the characters look authentic. You don't need to be a fan of Mario, Sonic, or the Olympics, to love this game. 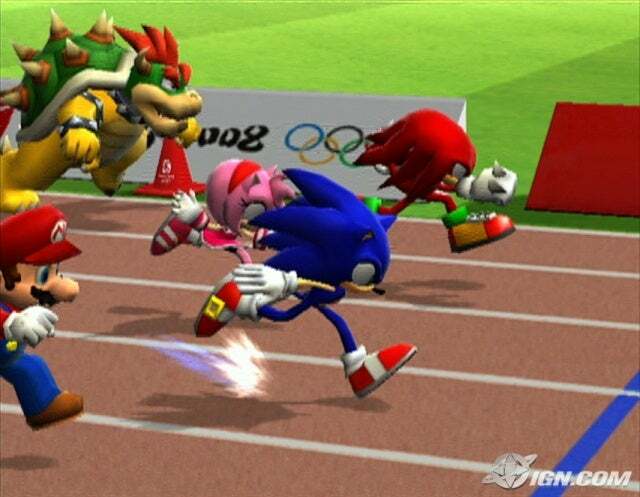 Mario and Sonic at the Olympic Games is fun for the entire family. Click here to visit the official Mario and Sonic website.